Chongzuo Leaning Pagoda - One of the Top Leaning Towers in the World! What is the Chongzuo Leaning Pagoda? The ancient Chongzuo Leaning Pagoda stands on a small island called Aotoushan (鳌头山). The island is located in the middle reach of Zuojiang River (左江). The tower is situated 133 kilometers from Nanning. Chongzuo Leaning Pagoda was originally built in 1621. There are 5 storeys with one window in each storey in Chongzuo Leaning Pagoda. The bottom of the pagoda is 5 meters in diameter. The body is in an octahedron shape. What is surprising that no matter from which direction you watch the pagoda, it seems to lean to your direction. The pagoda is tilted outward by about 1 meter from the bottom. 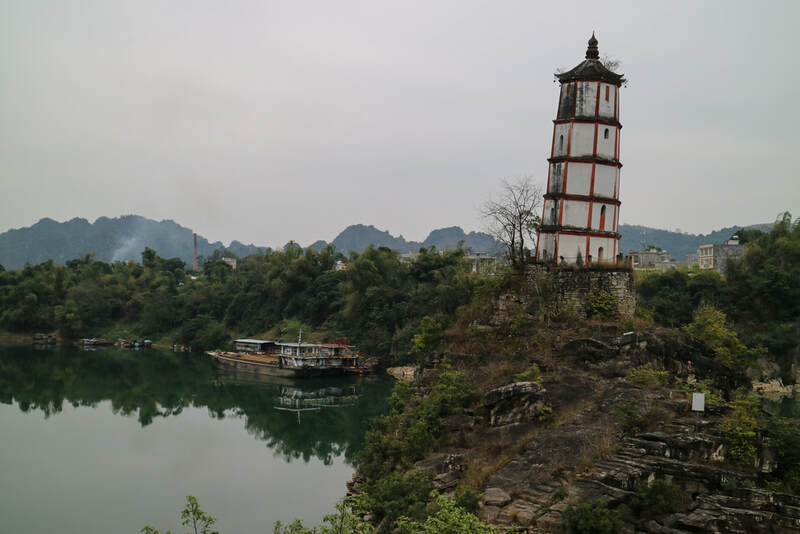 According to the experts' research, the craftsmen carefully designed the tower to take into consideration the wind of the river and foundation of the pagoda. If you are planning to visit Chongzuo Leaning Pagoda for photography purposes, the best time to visit is during the sunset. The ancient pagoda, the river, the sunset and the sunset clouds create a stunning view for photographers. Rent a vehicle departing from either Nanning or Chongzuo. This is the quickest and most direct option. If you depart from Nanning, take a bus from Langdong Bus Station (琅东客运站) and Jiangnan Bus Station (江南客运站) to Chongzuo. Then rent a local motorized pedicab to the pagoda viewpoint. You also can take a train from Nanning to Chongzuo. Then rent a local motorized pedicab to the pagoda viewpoint. As at 20th June 2018, visitors are not allowed to land on the small island and visit Chongzuo Leaning Pagoda in order to preserve the pagoda. If you are interested to photograph the amazing sunset along with the pagoda, please arrange your own transportation beforehand. Entrance pricing to the pagoda viewpoint is 5 CNY per person as at 20th June 2018. For the latest pricing information, please contact us via email (info@wendyweitours.com). The pagoda viewpoint offers a free parking lot. If you visit the pagoda in the morning or afternoon, please wear the sunscreen cream to protect your skin. Please remember to take an umbrella with you in case it rains or the sun is strong. Interested in visiting the Chongzuo Leaning Pagoda on a Tour? Wendy Wei Tours offers a variety of different packaged tours as well as custom tours including the Chongzuo Leaning Pagoda, among other attractions and destinations. To find out more, please visit our Tours page or Contact Us directly to find out more.